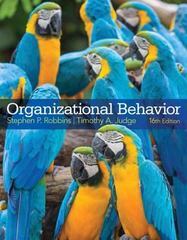 Organizational Behavior 16 Edition Long considered the standard for all organizational behavior textbooks, Organizational Behavior provides the research you want, in the language your students understand. This text continues its tradition of making current, relevant research come alive for students. The Sixteenth Edition has been thoroughly updated to reflect the most current recent research for Organizational Behavior, while maintaining its hallmark features –clear writing style, cutting-edge content, and engaging pedagogy. There’s a reason why Robbins textbooks have educated millions of students and have been translated into twenty languages—and it’s because of a commitment that provides the kind of engaging, cutting-edge material that helps students understand and connect with Organizational Behavior. For undergraduate and graduate courses in Organizational Behavior MyManagementLab for Organizational Behavior is a total learning package. MyManagementLab is an online homework, tutorial, and assessment program that truly engages students in learning. It helps students better prepare for class, quizzes, and exams—resulting in better performance in the course—and provides educators a dynamic set of tools for gauging individual and class progress. This program will provide a better teaching and learning experience–for you and your students. Here’s how: Personalize Learning with MyManagementLab: Inspire the exchange of new ideas and foster intriguing discussions with the abundant resources found in MyManagementLab. Help Students Better Understand Their Behavioral and Interpersonal Skills: Personal Self-assessment library (S.A.L) is a learning tool that includes 69 research-based self-assessments. Keep Your Class Current and Relevant: The most substantial updating ever:Every chapter of the Sixteenth Edition contains new or updated features. Note: You are purchasing a standalone product; MyLab does not come packaged with this content. If you would like to purchase both the physical text and MyLab search for ISBN-10: 0133802019/ISBN-13: 9780133802016. That package includes ISBN-10: 0133507645/ISBN-13: 9780133507645 and ISBN-10: 0133543897/ISBN-13: 9780133543896. MyLab is not a self-paced technology and should only be purchased when required by an instructor.